HTML disclaimers, which you create with CodeTwo Exchange Rules 2003, can include graphics. A classic example of a disclaimer containing images is a footer with the company logo. In a footer you can also include facsimiles, staff member photos, etc. An example can be found in "personal+image.html" file in Templates folder, which is located in the installation folder. It is not possible to add graphics to disclaimers formatted in plain text. To quickly and conveniently add images to footer templates, use the built-in signature editor. If you do not want to use the signature editor, remember to follow the guidelines for image insertion listed below. When inserting a picture into an HTML disclaimer, use relative or absolute path to the picture file. The file should be located on a local disk, not necessarily in the same folder the HTML disclaimer is located. Supported image types are: JPG, GIF, PNG, BMP. The BMP files are very large and therefore you should avoid using them. 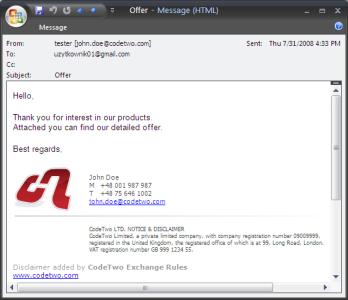 When CodeTwo Exchange Rules 2003 inserts a disclaimer containing images into an email message, it attaches images to the message as hidden attachments, which are sent together with that message. Thanks to that, images will always be visible on the recipient's side. In that case, the image will not be recognized by CodeTwo Exchange Rules 2003 and will not be added to the message. The figure below shows an example of a signature including an image. Fig.1. Example message including a signature with an image. While providing the location of your images, remember that this must not be a mapped disk. You can also insert an image located on a WWW server, but doing this does not guarantee that the image is visible to the recipient. This is due to the fact that some mail clients will block external content that may represent a threat.